(Jordan Allred | The Spectrum & Daily News) Weber State defensive lineman Carson Malan (44) celebrates a sack during Saturday's FCS playoff game against Southern Utah, December 2, 2017, in Cedar City, Utah. Weber State defeated Southern Utah 30-13. 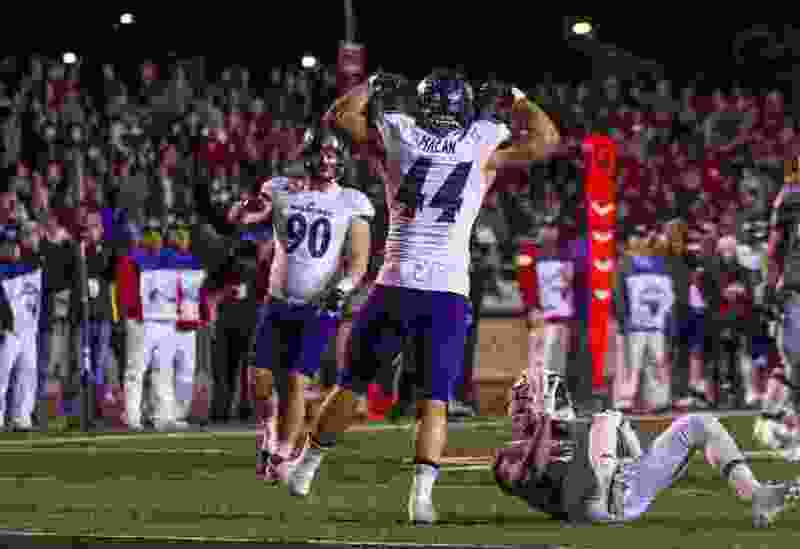 Cedar City • The standard playoff mantra that defense wins championships carried more than enough weight in the minds of the Weber State Wildcats. A shaky beginning wouldn’t matter in the end. Stefan Cantwell threw two touchdown passes and the defense came up with six sacks as the Wildcats wiped out an early 10-point hole and rolled over Southern Utah 30-13 before a school record of 11,811 fans at Eccles Coliseum. Weber State improved to 11-2 on the season and earned a trip to play at No. 1 James Madison on Friday night in the FCS quarterfinals. SUU looked strong early, scoring on its first two drives with a 16-yard run from Jay Green on fourth down and a 38-yard field goal from Manny Berz to take a 10-0 lead, but the T-Birds could manage only 35 more yards the rest of the first half. Things took a wild turn when SUU senior Chance Bearnson nearly duplicated his pick six from the first meeting at Stewart Stadium, but his interception of a Cantwell pass was returned to the Wildcats 13. From there, the T-Birds could manage only a 24-yard field goal by Berz, and the teams went to the half tied at 13-13. The turnover — one of three the Wildcats committed in the game — wouldn’t bother them in the least. Once the second half began, the Wildcats grabbed a stranglehold on the momentum. Cantwell scored on a 5-yard run on the opening drive, then threw a 10-yard score to Andrew Vollert on the next possession to stretch the lead to 27-13 and deflate most of the red-clad crowd. With the quarterfinal game up next against the defending national champion Dukes, Hill said big motivational speeches won’t be necessary.